A coalition of education advocacy groups released an online petition today calling for a one year waiver from using student test scores in teacher evaluations in Tennessee. A coalition of groups supporting public education today launched an online petition asking the Tennessee General Assembly and Governor Bill Haslam to grant teachers a grace period from the use of student test scores in their evaluations in the first year of new TNReady tests. The petition tracks language adopted unanimously by the Knox County School Board, which passed a resolution last week opposing the use of student test scores in teacher evaluation for this academic year. So, statewide TCAP results are out and as soon as they were released, the Achievement School District (ASD) touted its gains. But, what does all that mean? How are these schools doing relative to the goal of taking them from the bottom 5% of schools to the top 25% within 5 years, as founder Chris Barbic boasted before his recent revelation that educating poor kids can be difficult. By this metric the top performing ASD school from the first cohort was Corning with a score of 48.6 followed by Brick Church (47.9), Frayser (45.2), Westside (42.1), Cornerstone (37.6), and Hume (33.1). To check where these scores ranked compared to all the Tennessee schools, I calculated this metric for all 1358 schools that had 3-8 math and reading and sorted them from high to low. The values below represent the school’s overall score and their percentile relative to the rest of the state, in that order. So, the schools that have been in the ASD the longest, making the greatest gains, are at best in the bottom 6% of all schools in the state. That’s a long, long way from the top 25. But here’s something else. Back in December, the ASD decided to take over Neely’s Bend Middle School in Nashville. The school had been on the priority list, after all, and it was declared the victor in a school vs. school battle against Madison Middle. I reported earlier in the week about the impressive gains at Neely’s Bend. In fact, the state’s TVAAS website shows Neely’s Bend receiving a 5 overall in its growth score — the state’s highest number. I wondered where Neely’s Bend might fall in comparison to Rubinstein’s analysis of the ASD schools that had been under management for the past three years. Turns out, Neely’s Bend’s proficient/advanced composite for reading and is 54.4. Yes, you read that right. 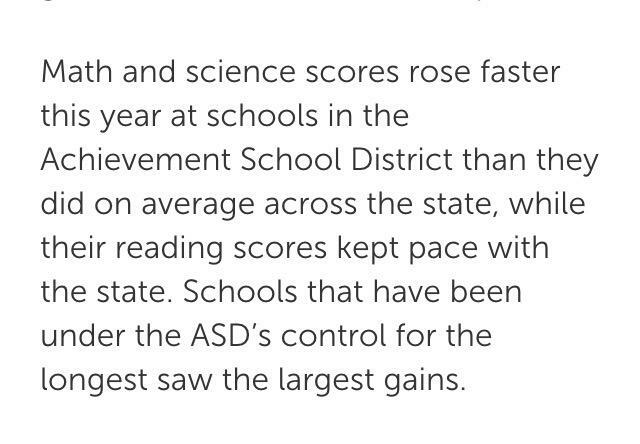 Neely’s Bend’s score is 5.8 points higher than the best performing school that’s been under ASD control the longest. Neely’s Bend is being taken over and converted to a charter school and yet the school posted significant gains (above district average), has a TVAAS overall score of 5, and has a higher percentage of students at the proficient/advanced level than the BEST schools under ASD management.